With Michelle off to London last night, I had a day alone in Fort William to explore, shop and relax a little before the evening train trip back to London. I thought about making a day of it and going to see a distillery or even take a train trip somewhere, but I really needed a down day, and it was the perfect sunny day to do a little local exploring. Plus my suitcase contents needed a revamp, laundry needed sorting and I had to buy some more provisions for my next hike with Nikki in a couple of days. Laundry is such a mundane topic, but it really rules your life when you’re trying to live out of a suitcase. Fort William is a fair-sized town compared to anything we had seen since Milngavie. It has a High Street with chain stores, most of which are for tourists. My watch broke for the second time just before this trip and buying a new one sounded like a good focus for an hour or so, but I guess pedestrians in Fort William don’t buy watches as the only jewelers was closed down. But I was able to buy a few hiking shirts from some of the many outdoors shops – all of which had big sales on – plus toiletries and other bits and pieces. I walked around the green and looked at a couple of churches and pretty gardens. 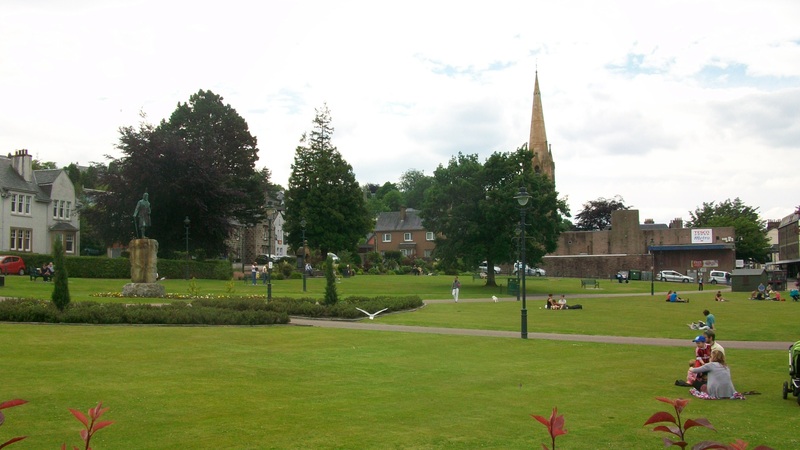 I guess sunny days are rare enough around here as the town green was covered in people sitting on the grass enjoying the sun on a Tuesday morning – and they weren’t tourists. I walked down to the water’s edge. 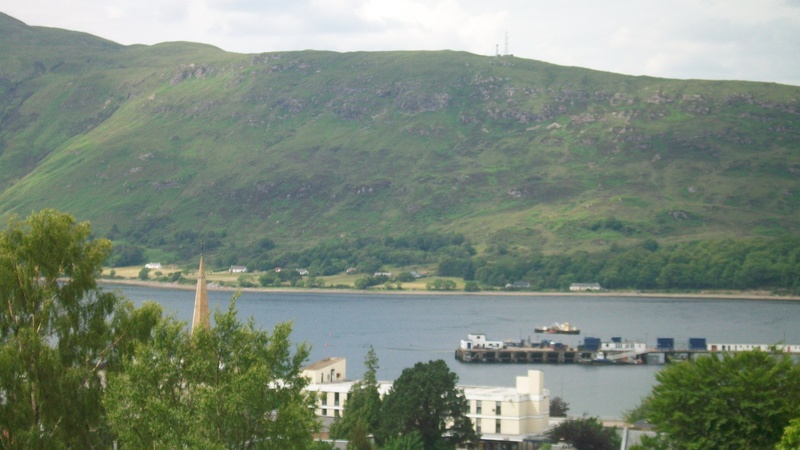 Fort William is on the sea with fishing boats and ferries coming and going up the channel. Its not upmarket enough to have fancy fish restaurants, but it had a couple of interesting looking places that were a step up from a chippy, and would have made a good dinner spot if we had had the time. I liked Fort William. I’m sure I was seeing it in its best light with the sun shining, and there were signs that the economy was struggling and very reliant on the tourism. But I also got to see some typical rain as the weather had turned quite quickly as the afternoon wore on. I left for the train station in pouring rain, boarding the Caledonian Sleeper around 7.30pm, for arrival in London around 7.30am the next morning. Then on to “Following the Acorn…” Yet another walk. I must be nuts. More to follow. This was our last day, and quite a long and tough one. 14 miles with two climbs, two descents and a moor crossing. For the first time we were somewhat under a timetable as we needed to get Michelle back to Fort William in time to catch the 5.30pm train back to London. 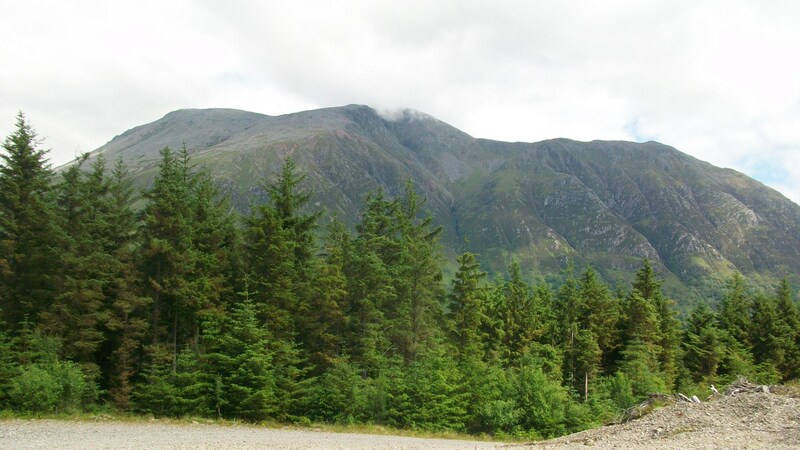 We were originally both staying the night in Fort William so we could either climb Ben Nevis or at least take some time to look around. However, Michelle had to make a change to her plans, so she would be leaving close to our arrival at the B&B. So we managed an earlier start of 8.15am from the Kinlochleven B&B and started immediately on the first climb of the day. It was through a wooded hillside and a pretty, sustained ascent. After about an hour of climbing the trail heads out on to open moorland, and you can see the next few hours of trail stretch out in front of you for a long, long way. I didn’t measure how long the moor stretch was but it went on for a long time. Perhaps 6-8 miles, and the terrain didn’t change too much for that stretch, making the walk feel a little monotonous. There were few landmarks either. The most notable one was an abandoned farmhouse. It had long turned into a ruin and, although the roof was long gone, the walls were built so thick and well that the main structure still looked pretty stable. After about 8 miles, the path turned to what was supposed to be another ascent through woods. However, there had been a great deal of deforestation and this whole section was now a wasteland of tree stumps and dead branches. Not very pretty. We started glancing more at our watches, trying to calculate how far we still had to go so that Michelle had time for a shower before the train. When the trail is more strenuous it can be so much harder to calculate how long 1 mile will really take, and we still had about 7 left. The remaining stretches of the walk took us through a forest (that still had trees) through needle-covered woodland floors until we saw our first glimpses of Ben Nevis. Unmistakeable. The final stretches were down a very wide level track that seemed to descent forever into the Glen Nevis area, then across some flat fields and out on to the road. The road was not a very welcome sight. It felt wrong to be forced to march along concrete after walking so far to reach the end. I seem to find it harder and harder to walk on paved roads and my legs were just seizing up about a mile into the two mile stretch to the finish. We were doing well for time, so we took a rest for a bit at a carpark just for some relief from the pavement pounding. Finally, we found the strength to march the last mile and reached the official marker for the end of the walk. This was to be our second shortest day: only 8.5 miles. 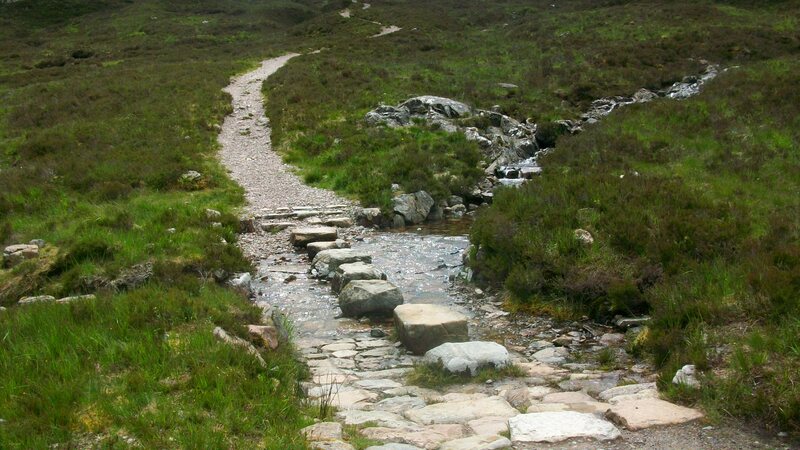 Its known for the steep climb called the Devil’s Staircase, which takes you up and over the ridge between Kingshouse and Kinlochleven, across a mountain saddle with expansive views, and down around the valley to Kinlochleven town. 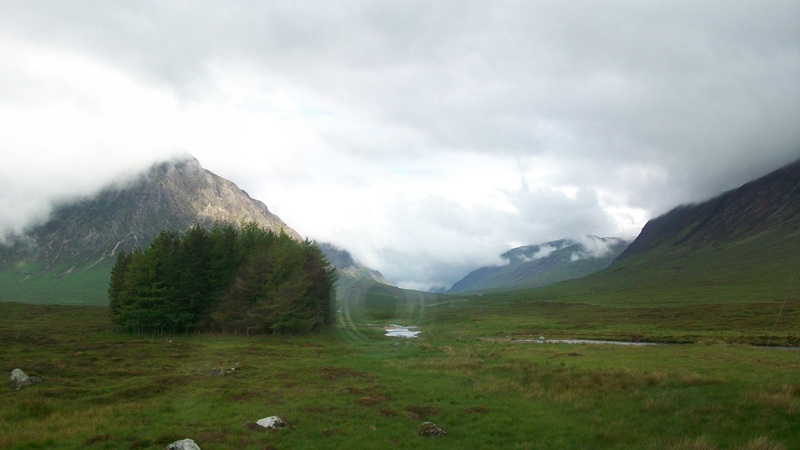 Again, we delayed our departure from the hotel for a while to avoid arriving to early at our Kinlochleven hotel. The weather report was very good (for Scotland) offering light cloud cover all day with a promise or two of sun later in the day. Despite this, it is difficult not to pack the rain gear away as you quickly learn what a difference it makes to the journey if its there when you need it. We left around 10am, and headed up the U-shaped valley that had been partially obscured by clouds on our arrival yesterday. We also got a much better view of the pyramid shaped Buachaille Etive Mor, which had been visible from almost every window during our stay. The path to the Devil’s Staircase is easy across fairly open moorland, and is over quite quickly. Before tackling the climb, we took a few minutes to rest and take in the moors across the way. 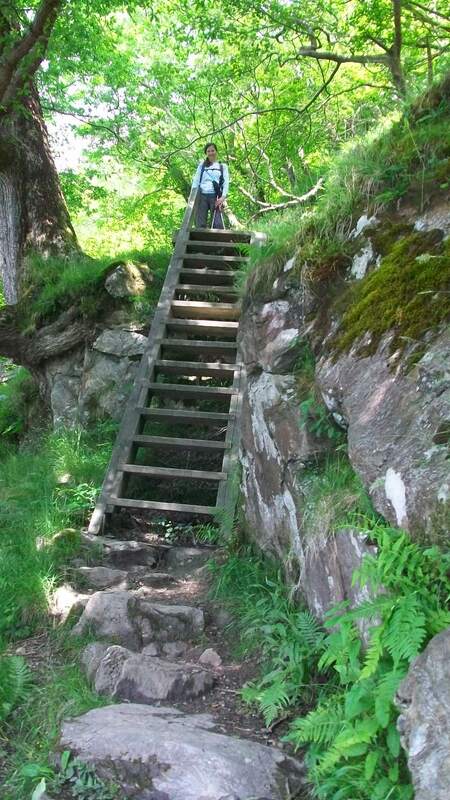 Climbing the Devil’s Staircase is easier than it sounds, although no breeze. I puffed and panted plenty and took lots of rests, but I could tell my lungs were in better shape than just a few days before on Conic Hill. The ascent took about an hour. At the top the descent starts almost immediately, but slowly, across a particularly pretty saddle which offers views of mountains and moors on both sides. I really liked the stepping stones across the streams. 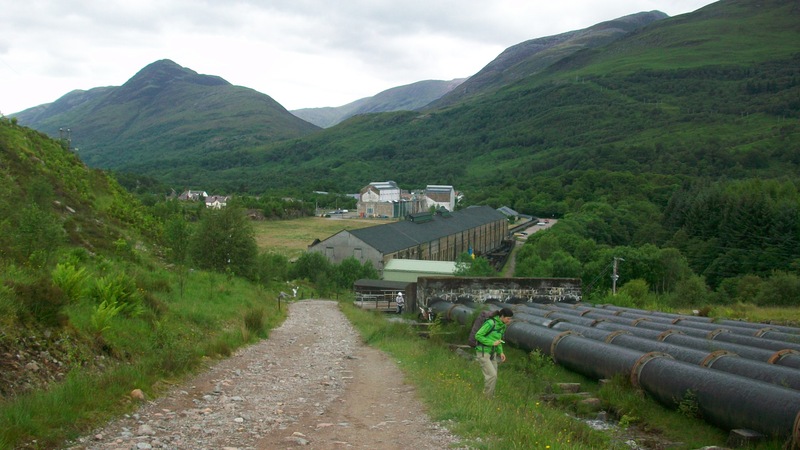 In the far distance, in what looked like just around the next mountain, you could see a small corner of Kinlochleven town. It seemed like a fairly simple journey now, slowly down the mountain and around the next foothill into the town. We were wrong. It was still another 2hrs of descent, broken only occasionally by some more climbing. We descended, and then descended some more. There was a particularly long portion of very steep descent that seemed to go on for ever, which gets progressively harder on your legs by the minute. 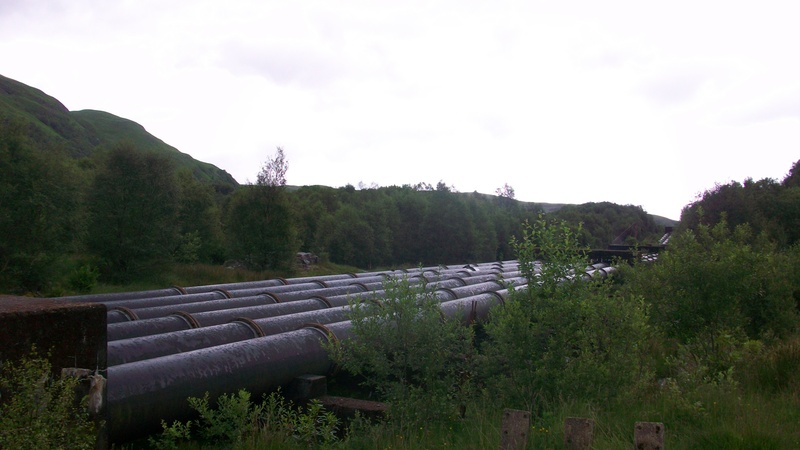 I waddled into Kinlochleven really desperate from some tea and break. We killed an hour in the local pub, drinking tea and waiting for the clock to roll around so we could arrive at our next B&B, Edencoille. It was a 4-star accommodation with bathrobes, heated towel racks and a reputation for excellent food. Probably the nicest B&B we stayed in during the walk. 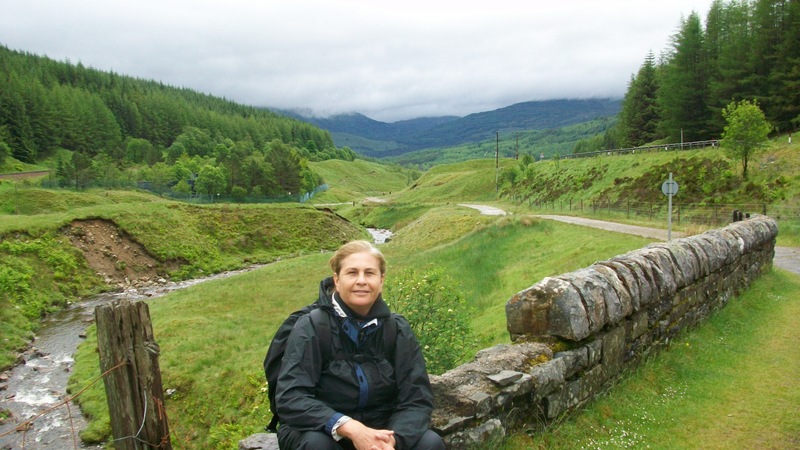 We had dinner in Kinlochleven that evening. 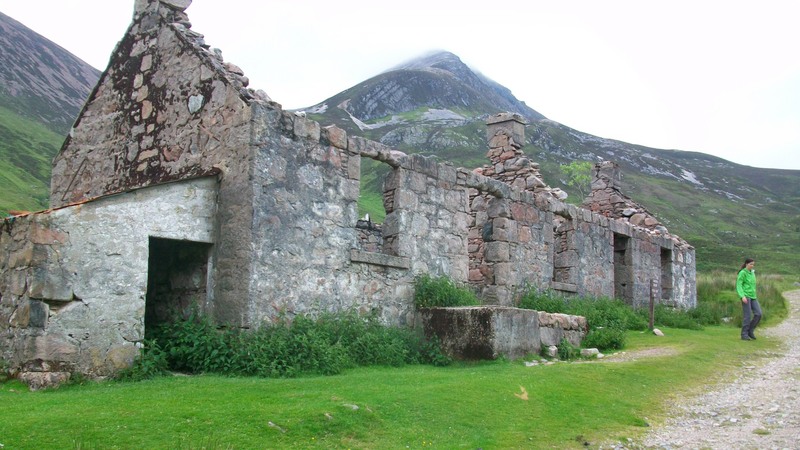 The guide book had dissed the village for being an eyeshore “the ugliest on two thousand miles of Highland coast” and pointed out the now closed aluminum smelting works that had provided work for the town. It wasn’t ugly at all, and quite charming actually. Sure, all the houses had been built by the factory and all looked the same, but they were freshly painted with hanging flower baskets and people took care of them. I could show the author a great deal more ugliness than that. Tough, short day. One more to go tomorrow…..
…or The Day of the Moors…. I knew I was going to have mixed feelings about this day. 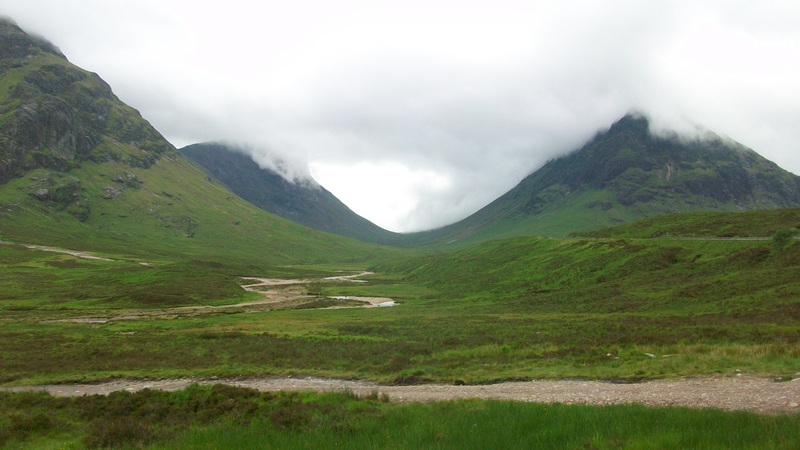 The 13-mile trek from Bridge of Orchy to Kingshouse crosses Rannoch Moor. It one of the highest rises on the journey and one of the bleakest spots. Once you start the crossing at Black Mount, it is a straight 10-mile walk without civilization or shelter, and today the clouds were sitting low and the weather was looking iffy. 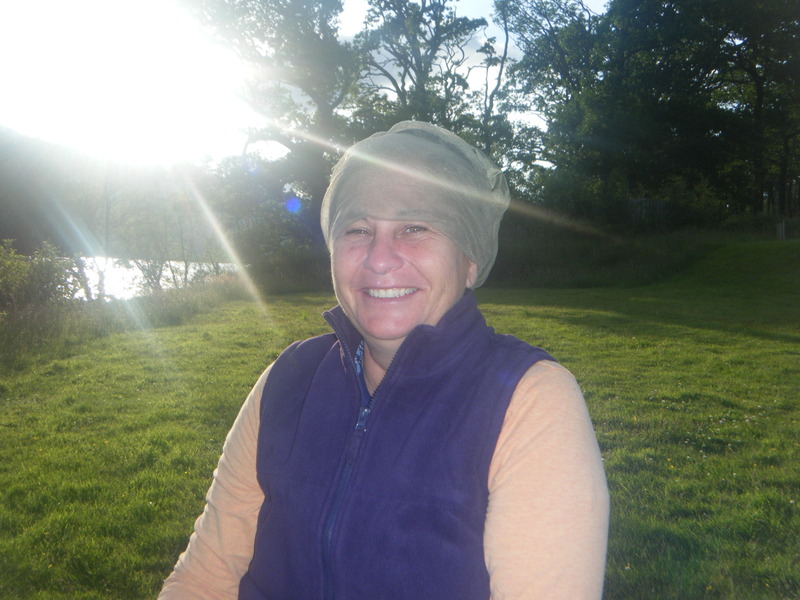 My mind went back to the day Carla and I crossed the North Yorkshire Moors in 2009 in pouring rain, thunder and lightening. The journey had been very wet, tiring, long and a bit scary. So today I was feeling a little anxious. But I also love the Moors because of their seclusion, openess, and wildness. It would have been a real loss to the walk to miss them, and yet a taxi ride to the next stop was looking very tempting. I kept fretting and checking the weather forecast. I needed more information. The odd thing about this trip has been the absence of Scots in service positions. All our waiters, receptionists, or cashiers have all been Eastern European, often Polish. 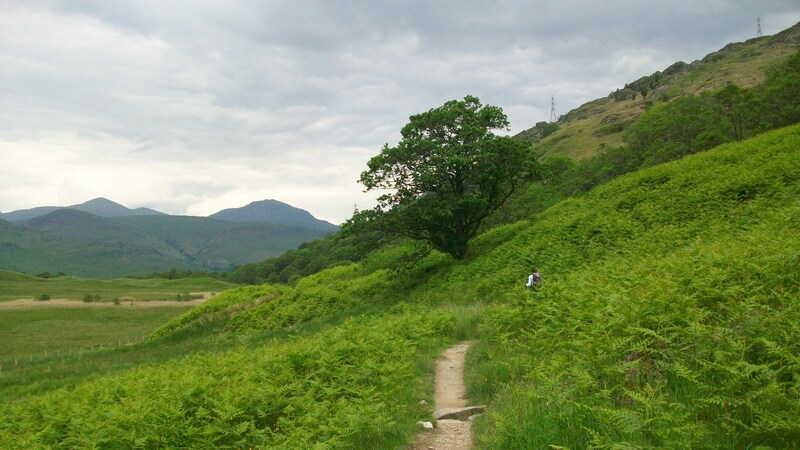 Just three years ago in the Lake District, I would talk to a local and get a feel for the walk and weather conditions. It was no different here and asking for help seemed a waste of time, but fortunately the South African receptionist knew the path and conditions, and I left feeling better and more prepared for the day. The walk started with a quite simple hike of a few miles to Inveroran where we stopped for a brief cup of tea in virtually the only place there, the Inveroran Hotel. After this the road takes you out to a conifer plantation and the start of the moors. The weather held, and the cloud level rose. The track was wide and dry and it was a straight easy path through the moors with enough visibility to enjoy the scenery. The climb up was gentle, and it was only once we reached the 1490ft summit that the temperature dropped quite a bit, and the wind picked up. The descent too was mostly gentle, and after just a couple of miles, we saw our next destination, the Kingshouse Hotel, in the far distance. What a welcome sight that was! Especially, as the wind and rain was starting to pick up. Once we had climbed over the crest, the wind was in our faces and stinging our cheeks. But the descent was reasonable and the Hotel rarely left our sight, egging us on. I liked the Kingshouse Hotel. At 87 pounds night (and the only Inn not to include breakfast) it was expensive. It was a bit shabby, and had a serious insulation problem. The room was drafty and the bathroom was in serious need of repair. But it was full of history and had stood at the edge of the moor for centuries for weary travelers like us. The lounge had a coal fire and the views from the windows on all sides were spectacular. We were literally in the middle of nowhere. We had arrived in enough time to enjoy the sofas, catch up on emails and rest up a bit. We had a leisurely start to this leg of the trail. Its only about 5 miles, or about 2.5 hrs of travel. It could be tagged onto the previous day, but we would have made it another long, exhausting trip, and it was time to take a much needed break. The internet at the unspectacularTyndrum Lodge was suddenly working, and we took advantage for the first couple of hours, catching up on email and adjusting travel plans. With such a short trail, we needed a late start so that we didn’t arrive at the next hotel too early. So we headed out at around10.30am, just as the sky was starting to brighten a little. The walk was easy on wide trails, taking us around the foothills and following the road and railway line for quite a while. It was pretty, open country with more sheep than I’ve seen on this whole trip so far. I particularly liked this spot by the river, sitting on a rock, taking a little break. It was good to have enough time to really enjoy the view without worrying how many miles we still have to cover or how the weather would turn. 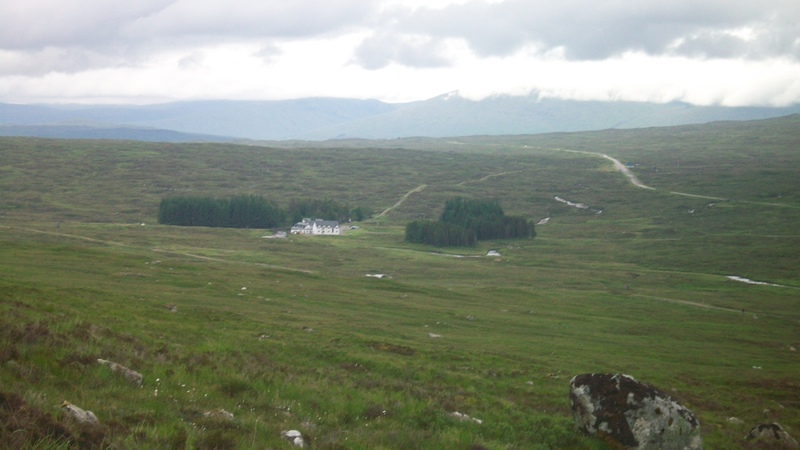 Arrival at The Bridge of Orchy was just a simple descent down into the hamlet. There’s a station, a few houses, a post office, a church and a hotel. 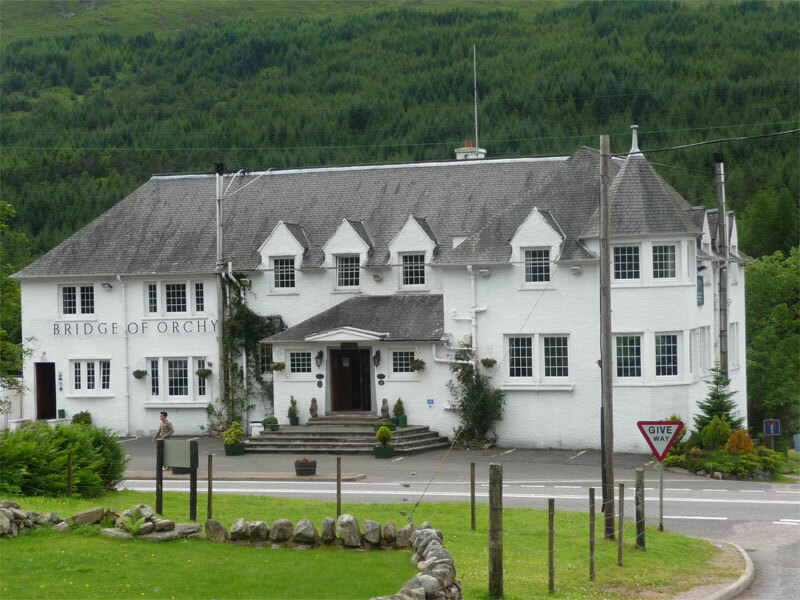 The Bridge of Orchy Hotel was charming and comfortable. A big contrast to the Bates Hotel from earlier the same morning, with a nice bathroom, a good restaurant and lots of nice little touches. Of course, it was also twice the price. But this was a reward hotel after staying in some cheaper places. We had a nice dinner in the restaurant and an early night as the next day was going to be more taxing. Leaving Inverarnan the weather forecast was dreary. It promised a 50% chance of rain by noon, with the odds increasing to 100% by the early evening. The incentive was to get out of the hotel as soon as possible to cover as much ground as we could before the rain began. So much for odds, as it started raining as early as 10am and continued with a moderate force for about 2hrs. It was the first time we had to break out the rain gear and the prospect of seeing the world from inside a plastic bag was a little discouraging. However, there is nothing like actually getting uncomfortably wet to make you stop, put the gear on and adjust to the new conditions. After a while I got used to seeing the world from the inside on my hood, and got back into the swing of things. We covered quite a variety of terrain. The day started out on a wide, level path through a country park, and then veered to the right, following the giant electric pylons that run down the valley. Although they do mar the otherwise idyllic landscape, they were not too obnoxious, and there was plenty else to look out. The nearby mountains were still visible through the light rain. 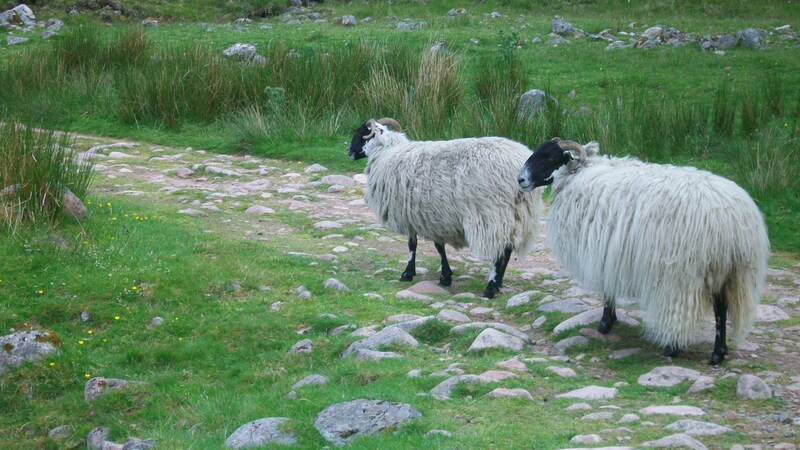 Sheep watched us from the fields, and the bracken pathways wove prettily through the gentle ups and downs of the trail. 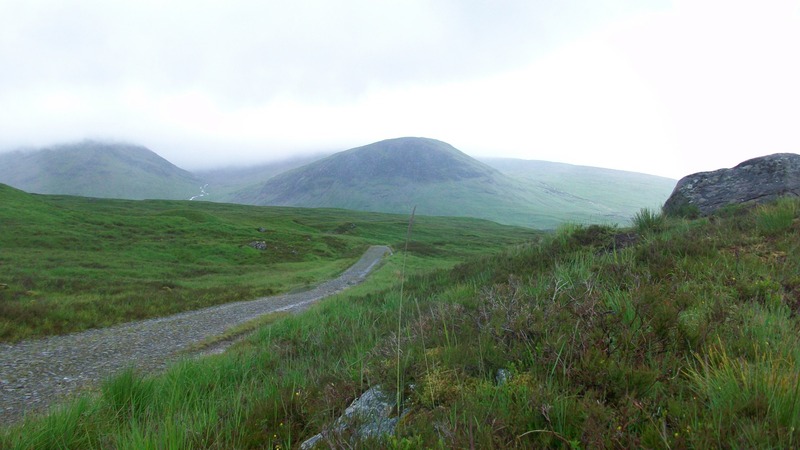 Once we crossed the A82, the terrain changed to a more open slope and the rainfall picked up. We were forced to cover our packs and legs, and carry on for a couple of more miles down the path. 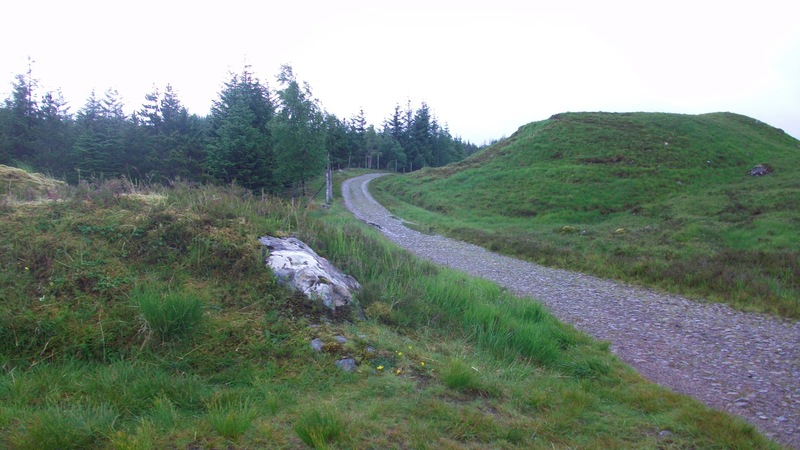 Here the Way turns left towards Tyndrum, but as there was no lunch spot available, and in the rain this meant a straight march all the way. 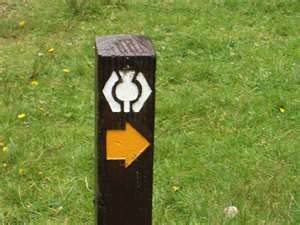 Turning right would mean that we could go to the nearest village to shelter from the rain and get a bite to eat, but it was a 30 minute detour from the path. We chose option A: to keep going. Next the terrain changed to forest and we climbed way up into it, and then hiked down the steep descent to the forest floor, and picked up the river. 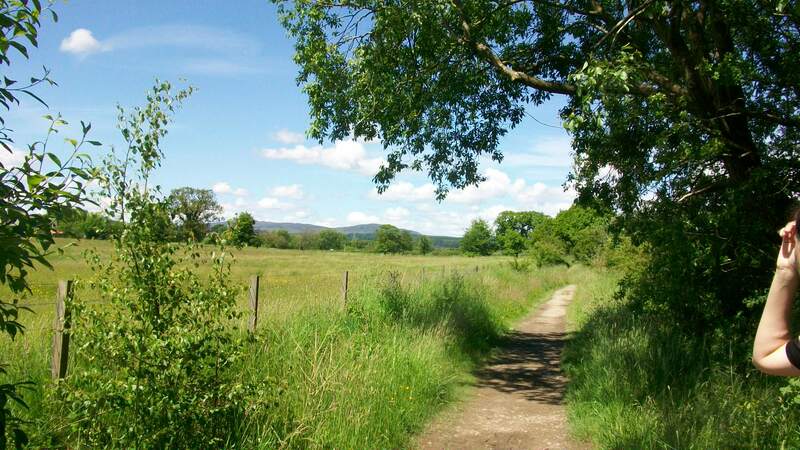 Following this for a few miles the trail brings you to more bracken covered moorland, some priory ruins and – the glorious unexpected offer of a hot cup of tea at a camping/wigwam village. When you’re tired and soggy, even tea in a Styrofoam cup tastes wonderful. I had two. 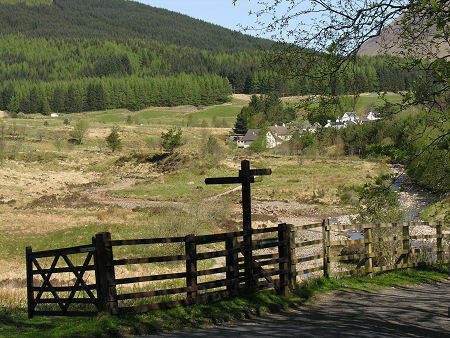 After a longish break, we had but two miles to Tyndrum, the rain had completely eased off, and we had a pleasant walk into the town. 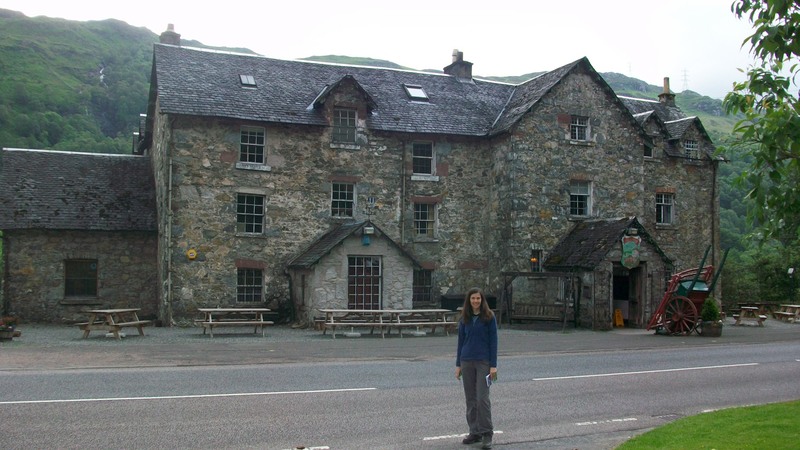 Our accommodation was the Tyndrum Lodge, and not one of my best choices. It’s the closest comparison would maybe be the Bates Motel. It was rundown, neglected and just sad. The attached Paddy’s Bar was owned the same family, and quite popular, helped tremendously by the fact that it’s the only pub in town. But we ate instead at The Real Food Café which had a good fish and chip menu with a focus on sustainability. 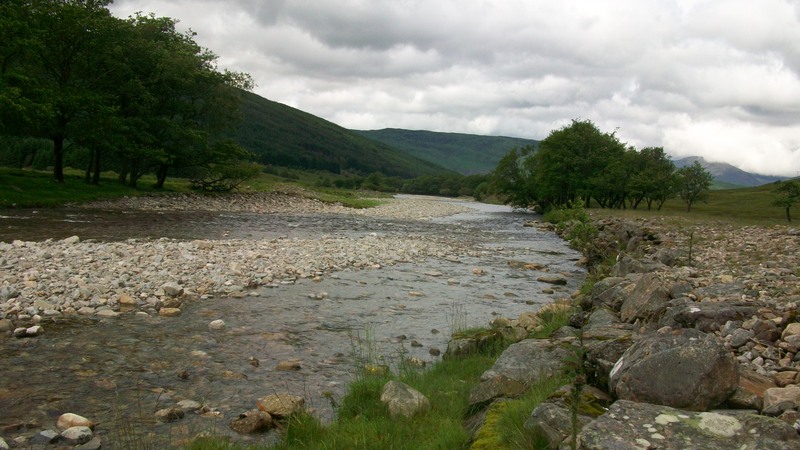 Tyndrum has the last shops until Kinlochleven – two days away, so we also shopped for a few supplies. No real photos today — sorry — camera was buried in the dry bag! 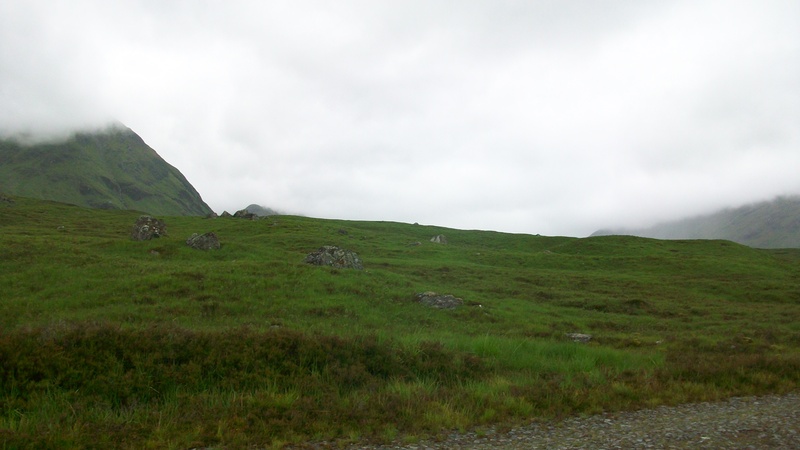 …or the day of rocks and midges. We got off to an earlier start. It was going to be another 14 mile day, broken in the middle with an opportunity for lunch at Inversaid. The guide book promised an easy trek to Inversaid, with only gentle ups and downs along the shoreline and through the woods. What it didn’t mention was the waves of midges that we would encounter, particularly in the woods. Since our departure from Drymen the midges had become a lot more obnoxious, but we found that as long as you kept moving, they didn’t really bother you. But this is only true if the concentration of midges is moderate. In heavier areas they fly at you, as you move, landing in your eyes and mouth, if you open it too wide for air as you pant uphill. It was a tiring first half of the day. We were basically unable to stop for longer than a minute for the 3.5 hrs it took to walk from Rowardennan to Inversaid. It took the midges about 15 seconds to find you, not long enough to pee or even drink, and certainly not long enough to rest. Occasionally we would stop somewhere for a moment and it would be midge-free for as long as five minutes, but overall it was non-stop to Inversaid where we arrived at the Inversaid Hotel. The sun was still shining and there must have been about 20 hikers around all the wooden tables outside; midge-free because of the wind that was blowing. 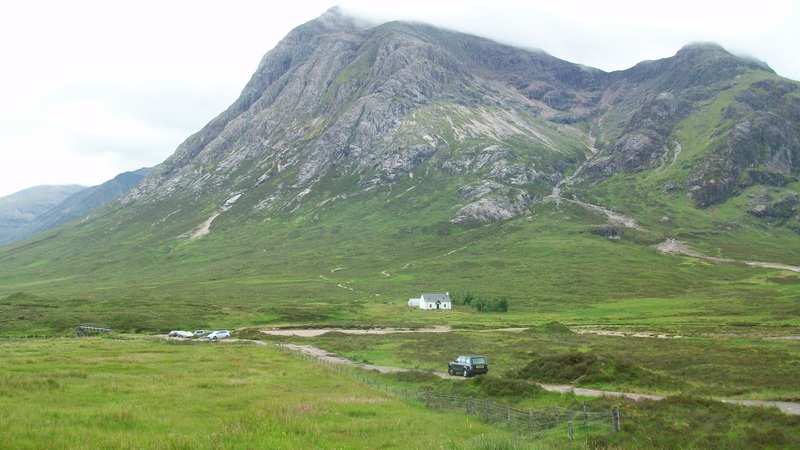 However, we ate a light lunch in the dining room, which overlooked the North end of theLoch, served by one of many Polish waiters we were to encounter on the trip. It’s a bit disconcerting to be in a remote Scottish location and not interact with Scots. The hotel was nice enough though and would have been a pleasant place to stay. 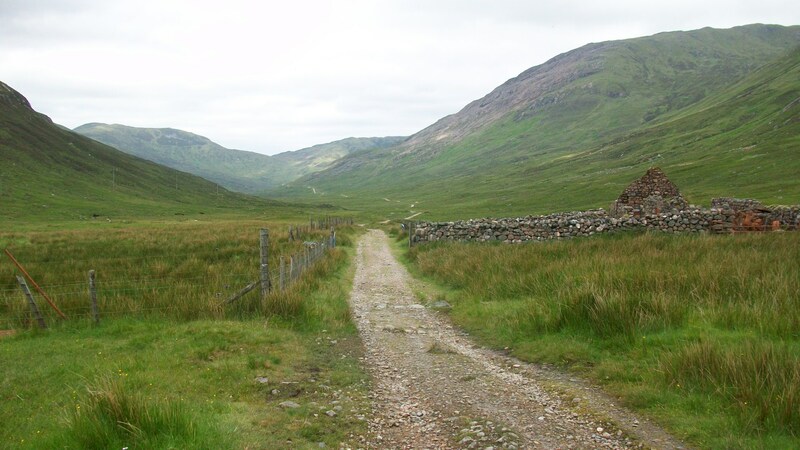 The afternoon walk from Inversaid to Inverarnan is said to be one of the hardest parts of the trail. The way is really rocky underfoot and every step is a calculation of stride and balance. Here, some of the Way takes you over large rocks, and you have to haul yourself up them, and then half-scramble and slide your way down. Its slow going, but a particularly lovely part of the walk. The hike takes you towards the end of the lake shore with a final climb up a rock face via wooden ladder and out into the bracken covered fields north of Loch Lommond. Ireally liked this section. It was so green, with the interesting texture of the bracken everywhere. We spotted some wild goats and the path took us closer and closer to them as they stood munching on the ferns. They had some pretty fierce looking horns and I didn’t want to risk stopping to take a photo, but they were pretty tame and much more interested in their bracken dinner than a pair of hikers. The bracken covered slopes as you approach The Drovers. Goats were hidden in there somewhere! Arrival at The Drovers Inn in Inverarnan was at about5.30pm, we had been on the road for 9 hours. We saw the old stone building from a distance as we turned from the path to the main road. We’d been promised an old, charismatic building with oddities and men in kilts. Walking into the reception, there were stuffed animals and a big mangy stuffed bear striking a fiercesome pose. We learnt from reception that our stay at the Inn was actually in the 1980’s lodge over the road, which was nowhere near as interesting. I felt we had been mislead, and somewhat taken by the hotel. The staff were friendly and willing but not very knowledgeable. More Polish servers, this time in kilts, and no-one that seemed to have spent more than a week on the job. Too bad, as it was worth seeing. But I would recommend staying in another nearby location and just visiting The Drovers Inn for dinner. Fairly early on in the second day, you are presented with two alternatives: a shorter walk along the paved Loch shore, or the higher, more strenuous route over Conic Hill with the reward of excellent views. 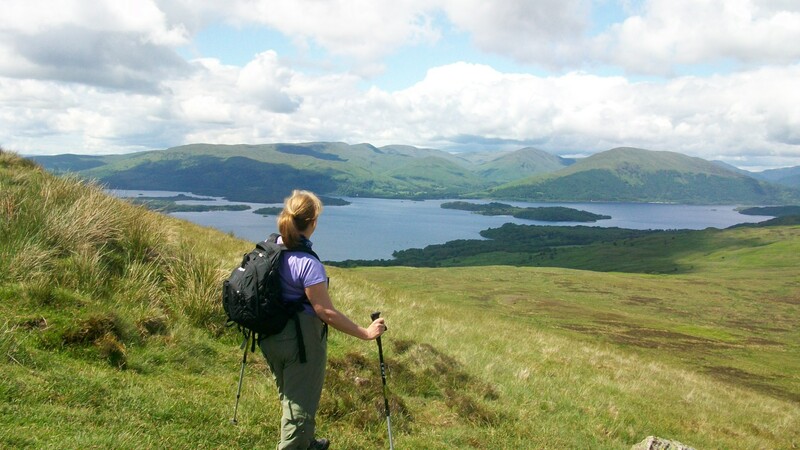 Our B&B hosts recommended Conic Hill as one of the highlights of the West Highland Way. We took it and it was everything it was claimed to be: tiring, quite strenuous but very rewarding on a sunny day with our first real views of Loch Lommond. Beautiful. We had gotten off to a late start in the morning, and after climbing Conic Hill way too slowly, we didn’t arrive at our lunch spot for the day until well after 1.30pm. After a little food and a half an hour break, it meant we weren’t starting the second half of our fourteen mile day until after 2pm. The walk was mainly along the Lochside, but very long. There were plenty of ups and downs, and steep crags to tackle with their sharp climbs and vertical descents. Very hard on the legs after so many hours. 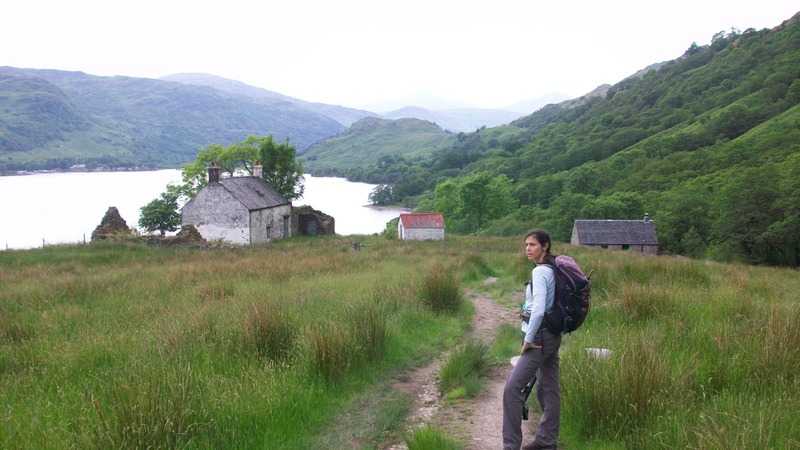 Once we finally arrived at Rowardennan, we still had another 15 minutes of walking to the Rowardennan Youth Hostel, our destination for the night. It felt like 15 more miles. It fact, it was just 14 miles total for the day under our belt. The YHA was fine, but after a long, strenuous day like that you want someone else to take your suitcases for you, and being asked for a five pound deposit for your key is, well, wrong. We both decided that we were getting to old for youth hostels as we dragged our suitcases from the outside shed to our rooms. We were too tired to walk to the Rowardennan Hotel and decided to eat at the YHA, and it was actually a pretty good meal. 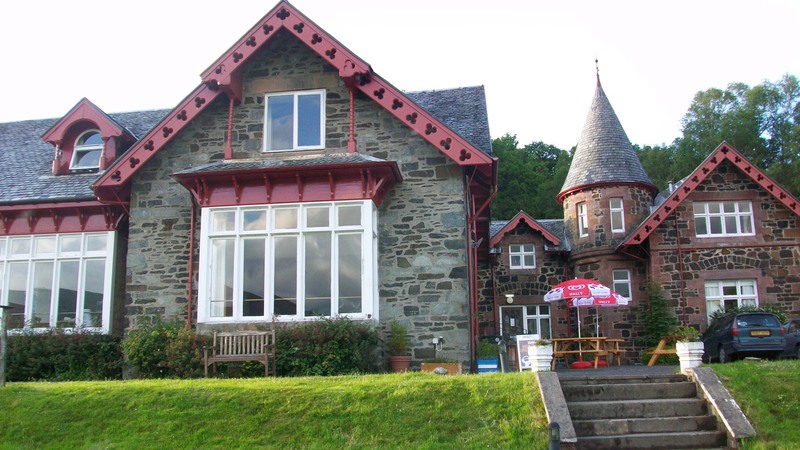 The YHA is located on the banks of Loch Lommond in a lovely setting. We picked it to throw a little low-end stay with some of our pricer picks (coming later) and for the beautiful views. After dinner we decided to try the front lawns and brave the midges a little. Sprayed all over with Bog Myrtle and wearing very attractive head nets, we sat and tried to enjoy the view. The little bastards descended in minutes. I must have had several hundred in a swarm around my head, sitting on the netting, looking at me. 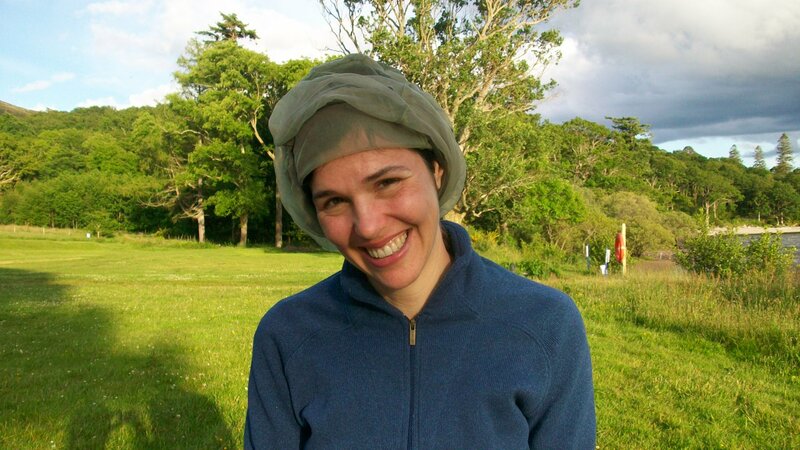 …and an equally awful one of me, as it just wouldn’t be fair…. Aside from looking silly, the netting obscured the loveliness of the lake very effectively, and the looming menace of the midges just inches from my face made the attempt to enjoy the location pretty futile. We went back inside. However, do the Scots live with them? And why would anyone ever camp next to the lake if it takes military-like protection to keep you away from the wee beasties? I fell asleep almost instantly around 10pm, my third night of going to bed while the sun still shone. It was starting to feel normal. We woke this morning to glorious sunshine, which I was sure would pass. Yesterday was miserable when we arrived at a grey and stony Glasgow airport and we were quickly told that it had been the most miserable, wettest Spring ever. (Although, I am sure it was in a long line of miserable-est, wettest Springs ever…..) Despite this, the sun came out this morning and stayed out all day. So we had a very pleasant first day of the West Highland Way. 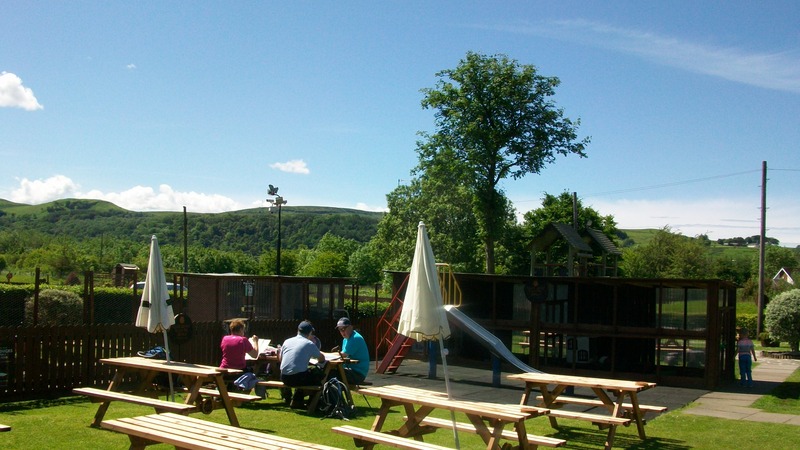 After our 9am sunny departure, we walked through rolling countryside, via a small park and a disused railway line, arriving at a very nice little pub around 12pm. They did a great job of making it an attractive destination for families, including a small petting zoo type of thing, with baby goats, ducks and bunnies. 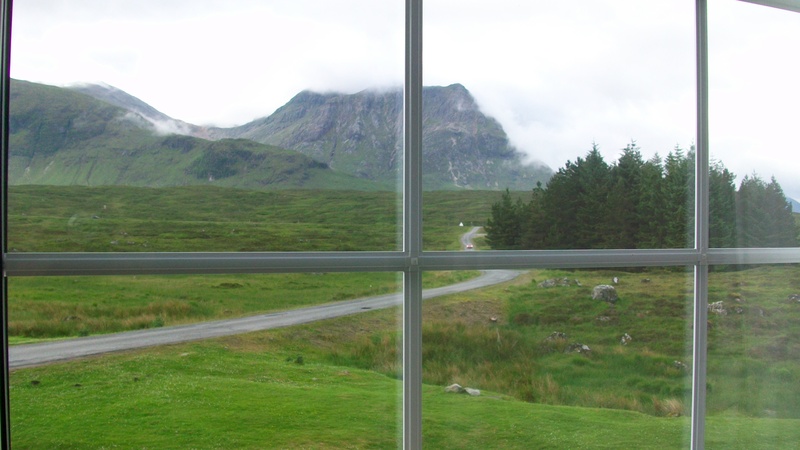 In the background we could see the first tantalizing glimpses of the Highlands. The second half of the walk was less interesting, but taking us along some pretty country lanes for several miles ending at our destination for the night, Drymen, and a total of 12 miles checked off. We arrived early and had a cold drink at The Pottery before showing up at our Bed and Breakfast. Stayed at Hawthorne House in Drymen, an excellent B&B with caring, friendly hosts, clean bright rooms, and a good breakfast. It was a good first day, challenging but not too tiring. 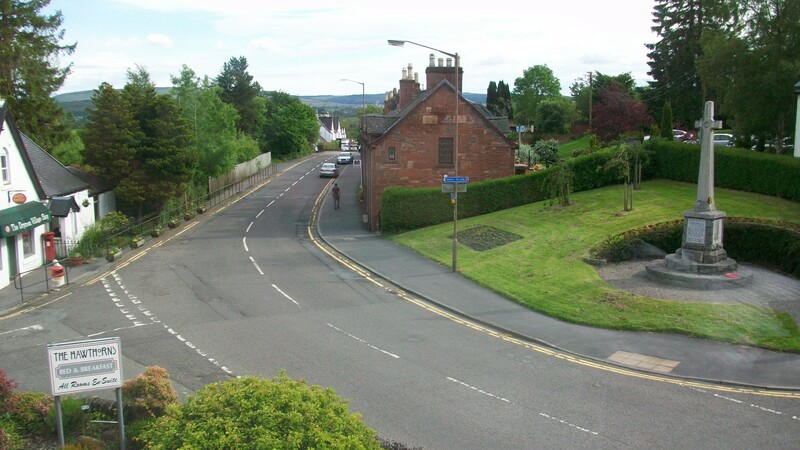 View of Drymen from hotel bedroom. 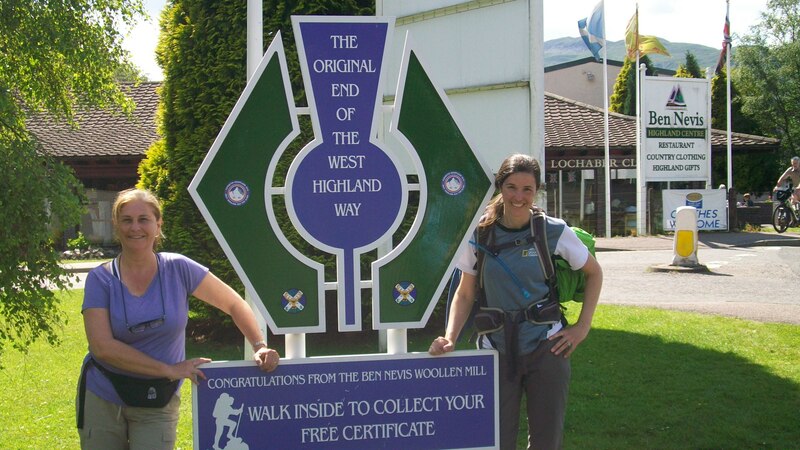 Three years since my last big hiking adventure with Carla, I have finally been able to make it to another long-distance trail, The West Highland Way in Scotland. This time my brave hiking partner is Michelle, a friend from Manila and my hiking buddy from the Banaue Rice Terraces adventure.